Decorating with rooster dinnerware is just fun. Just like the rooster crowing at dawn, this type of décor brings life to the kitchen. There are all kinds of ways to use this type of dinnerware for decorating. You can display the dinnerware in a hutch, on a sideboard, or in a china cabinet to make it the central part of your theme. A modern idea is to remove the doors off of your upper kitchen cabinets, paint the inside of the cabinets in a colorful shade with the outer cabinets painted white, line the shelves with a lace-edged liner, and display the dishes there. I find this very attractive. Rooster decor is also popular to use as an accent. Displaying plates in a plate wall-hanger is a great idea for adding this type of touch. There are many dinnerware manufacturers that make dinnerware adorned with roosters. Most of the dinnerware sets are somewhat casual. Pfaltzgraff Dinnerware is nice, and they make several patterns of rooster dinnerware. The Pfaltzgraff Daybreak pattern was a favorite of mine. It was retired in 2010, but you can still get some pieces of it and of course, you can find it on replacements sites and from time to time on eBay. I love the pastel colors that are used in the Napoli Rooster pattern . The colors of the rooster are vibrant, but the background gives it a comforting appeal. The Pfaltzgraff Everyday Garden Rooster pattern is cute. It has country charm. The pattern goes along well with Americana décor. For a whimsical, bright and cheery look, you might enjoy the Pfaltzgraff Everyday Early Bird dinnerware pattern . It features primary colors and in my eyes, would look great in a color-block decorating style kitchen. 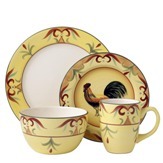 Another Pfaltzgraff favorite is the Tuscan Rooster pattern. I believe that this pattern is retired, but if you can pull a dinnerware set together, I'm sure you would enjoy the warm hues featured on this hand-painted dinnerware. If you need tough, hard to break dishes, you might like the Corelle Impressions Country Morning pattern . It is a long-lasting dinnerware set in addition to being attractive. This pattern has been retired, but it is still available in some outlets. Another nice pattern is the Gibson Royal Rooster . I love the scalloped edges and the pedestal featured on the coffee cups. These features add a touch of class to the dinnerware set. 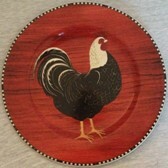 A cute Espana dinnerware pattern is the Cali Rooster. It is country-style with floral designs surrounding the rooster that is depicted on a warm background. The Country Rooster pattern by Tina Higgins is lovely and would make a good accent to country décor. I like it because the roosters depicted look real. I would look great displayed with solid-colored burgundy white, or black dinnerware. For individual dishes to use to complement your décor, you might try searching for rooster dinnerware on eBay. There is tons of vintage or antique dinnerware in this online auction. Rooster patterns are plentiful.